Vaping. It’s here. And if the numbers have anything to say, the e-cigarette movement is not going anywhere. If anything, it’s gaining momentum. Becoming a culture. With Vapefests popping up across the country and e-cigarette companies popping up left and right, it’s more important than ever for industry startups to lean on luxury packaging. If vaping is the future of smoking, then the NetBox is the future of e-cigarette packaging. These beautiful examples of custom turned-edge packaging are available with all the bells of whistles: soft-touch laminations, full-color printing, embossing and foil stamping. But, when it comes to vaping, this box is more than just for for show. Here are a few reasons, why a custom box like the Netbox can make a vaping kit shine. Vaping is more than just picking up a pack of smokes at the gas station. It’s got a certain class and elegance. It also has parts–and not the disposable kind. The ‘e’ in e-cigarette means electronic, which means you can’t just roll a vaping device up in your shirt sleeve–or shouldn’t, rather. 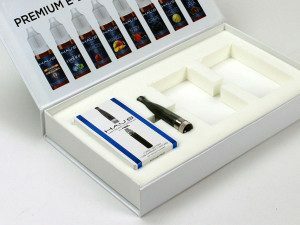 Quality vaping kits all contain basic components: an atomizer for heating the liquid, a battery, and cartridges, or containers for the liquid. These pieces are electronics and glass and should be properly packaged. Netboxes can be fit with diecut foam inserts or thermoformed plastic trays to hold these items. Protective packaging that’s also retail ready. Since an e-cigarette is more than just a stick, a custom box is a must. Without durable packaging, vaping kits couldn’t include all the necessary parts. And since those parts aren’t disposable, a vaper needs to be able to store the kit, either at home or on the go. 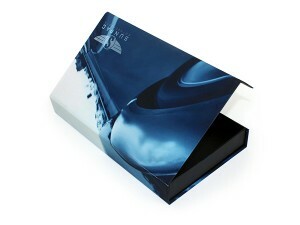 Attractive packaging like the Netbox becomes an heirloom–a futuristic humidor for vaping technology. There is a lot of pride amongst vapers. Custom mods and styles are all the rage. So giving the gift of sleek, luxurious storage that also leaves room for modifications is a strong selling point. The humidor was once the hallmark of cigar aficionados, a symbol of regality and wealth. Vapers want that feeling as much as anyone else, and elegant custom packaging from the get-go sends the message of class and sophistication. The NetBox is a magnet box, which is already a cool feature. That smooth, subtle snap of a magnetic tab sends the message of high-end. Upscale packaging goes a long way in an industry focused on appearance. In the end, whether vaping kits or a marketing kits, it always comes back to presentation. If you want someone to take pride in your product, the first step is taking pride in it yourself. And that starts with the suit it’s wearing.